Why Is It Most Important What Customers Say About You? It’s one of my absolute all-time favorite ways to earn cashflow. I get to do this with my family. It’s really close to home. It’s really, really fun for me. AND it makes a ton of money for us!! You’re gonna want to watch a real quick video about my journey as I’ve learned the tips, tricks and best practices in the STR market. 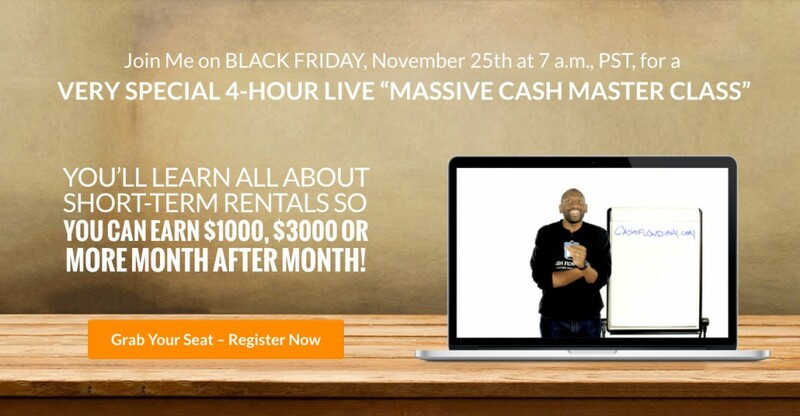 Now I want to share with you MY SYSTEM… so make sure you pay attention to what I’m doing Black Friday. Here’s a hint: IT’S A SPECIAL, LIVE, ONLINE MASTER CLASS!! Now, What about Those Happy Customers? In short, to earn the big bucks as the host of an STR, there are things you will have to do to make the guest experience top-shelf. 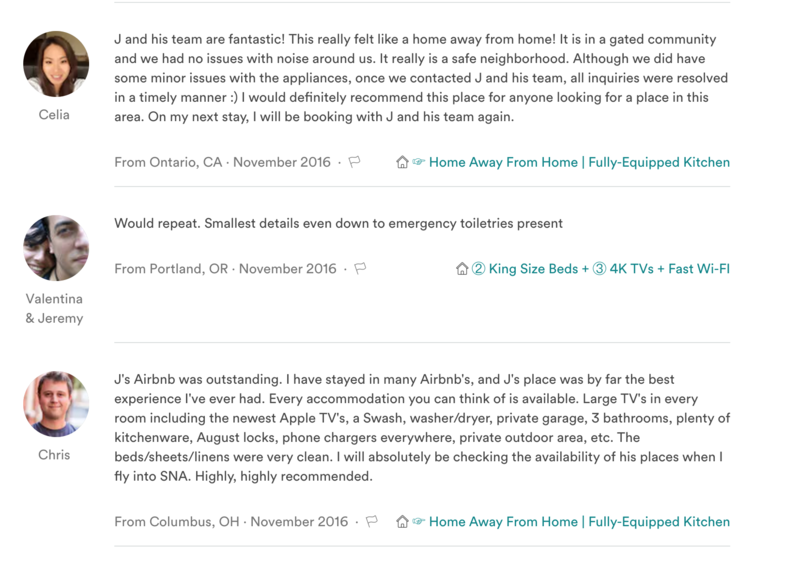 What’s really cool is the number of 5-star ratings we’ve received from guests who have stayed at our units. And why wouldn’t they love their stays at our properties? We’ve done lots of things to make the units into more than just places to stay. Each unit has been done with the help of a team… that includes a person with a great eye for design!! While I am involved in some parts of the setup of these units, because there are some things I actually enjoy doing. For the record, that’s not building furniture. We also choose units that don’t require much if any rehabbing. These units are move-in ready. So it boils down to talking to the property owners and striking a win-win deal. But there are lots of things you as the real estate entrepreneur has to know in order to talk to the seller or property owner to get the deals done. I want you to move like I am moving… getting a few units under contract quickly so you can create income that lets you walk away from your day job if that’s your goal. That said, using this STR strategy means you don’t have to quit your job if you don’t want to. It is something that can be built so quickly it would make your head spin. We have created our systems so that we can have a unit up and running in under two weeks and start booking guests right away. How Did I Venture Into This Realm? Here’s where I need to be transparent. This STR strategy is not a new thing. I know people who have been doing this for a couple of years and they graciously shared some of their information. I kept gathering information from those in the know and then I added my own spark of imagination and business savvy. Then I kept researching and learning. By spring of 2016 I was looking for my first property to turn into an STR. Once I found a few candidates I got in there punching, making offers and asking lots of questions. Just like asking questions of sellers, buyers and investors in any deal, that’s how you get to the YES. You also have to do something bold… just get out there and start making offers, just get out there and take the steps to get to your goals, and how to simply stop procrastinating!! Because I don’t procrastinate and I tend to move hyper-fast (just ask my team), I found my first ideal property pretty quickly, tried my hand at doing things myself, learned what all needs to be done to make a highly successful guest-ready unit, and then realized I needed more help than I thought I would, because I am not the guy for a lot of what needs to happen (like building furniture and cleaning things at the end of the day). Then my wife stepped up (our units have kitchens that would blow you away, cuz she’s a cook and she knows what a great kitchen needs) and other people I know who have different talent sets. My kids started hanging out with us and could for the first time see what Daddy does in business. That was by far one of the neatest things about all of this!! To see my kids really “get” what I’m doing is exciting for me. I mean really, really thrilling. They see themselves as a part of my team and they get to tell their friends about what they do to help their good ol’ dad and wonderful mother!! You can do what I am doing if you’re in the right market!! Some cities have passed ordinances against STRs, but lots and lots and lots of places allow it. You just have to follow a few rules and be a good neighbor. There are things you will not allow to occur on your properties, and that’s something you have to learn… if you don’t get guidance from someone like me. The class starts promptly at 7 a.m., PST, which I know is very early for some of my readers here. It could be that you have been hit pretty hard with some of our emails over the past few days, but what can I say? I’m THAT excited to be sharing my information and how-to’s with you so you can get out there even as soon as you’ve clicked off the class and spiffed yourself up to go look at properties.